This is a book that covers one of the hardest challenges of all, designing an API that is both long-lived, that meets business objectives, and that your users will love. Taking you through the full API lifecycle, it starts off by having an understanding of what it is you are building, and why. The book then transitions into modern design techniques for APIs, letting you take advantage of the latest technology to quickly build out and prototype your API before writing any code! Finally, it wraps up by hitting two vital components of an APIs success, management, and documentation. Ensuring that your API is as easy to understand and integrate as possible. While the REST design philosophy has captured the imagination of web and enterprise developers alike, using this approach to develop real web services is no picnic. Building a RESTful API is easy, but designing an API that meets business objectives, pleases your users, and is long-lived - now that's hard. 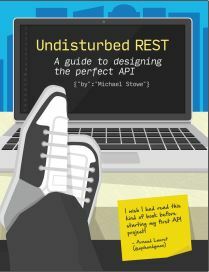 Undisturbed REST tackles these challenges head on, focusing on what you need to know in order to design the perfect API. Along with best practices and modern design techniques, you'll be guided through an understanding of the REST architectural style, hypermedia, and how to build an API that is both extendable and flexible. Mike Stowe is a Professional technologist and marketer with over 15 years experience. Author, speaker, and consultant with a focus on community development, software architecture, API design, security, and usability.